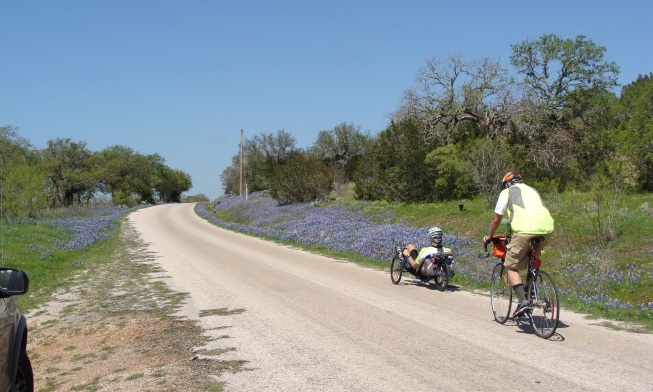 On Saturday 24 March, Don Senzig and I made a pilgrimage to enjoy the great wildflower show on some favorite back-country roads out west of Lake Buchanan in northeastern Llano County. Don did it on his road bike and I rode my Catrike Road. My Garmin Heart Rate Monitor/GPS thinks I burned just under 4,000 calories. For folks not in as good a shape as the two of us (average age about 72!) you can drive this route in your car. If you do choose to drive, for Pete’s sake roll down all the windows and enjoy the smells of spring as well as the sights. 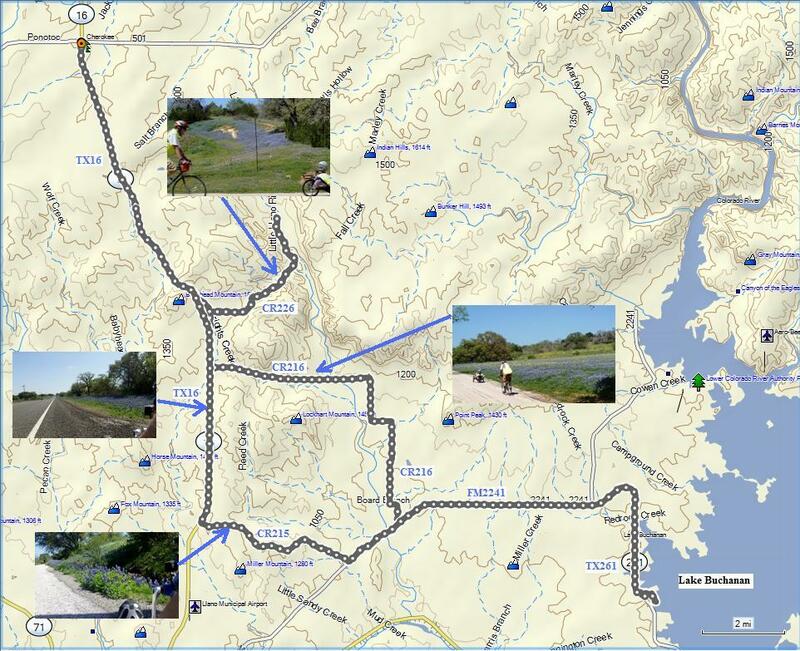 Our route is shown on the map below. Then there will just be lots of pictures and very few words after that. The route started and ended to the lower right end of the route. Went to CR216 then north and west to TX16. 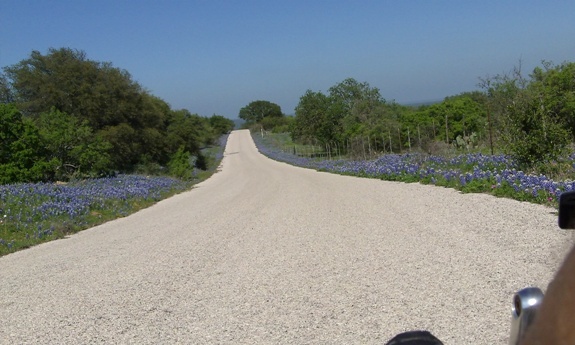 Then north to CR226 then north and east to the end of the paved road (San Saba County doesn't pave many roads). Then back down to TX 16 and north to Cherokee for a burger at the Cherokee Store. 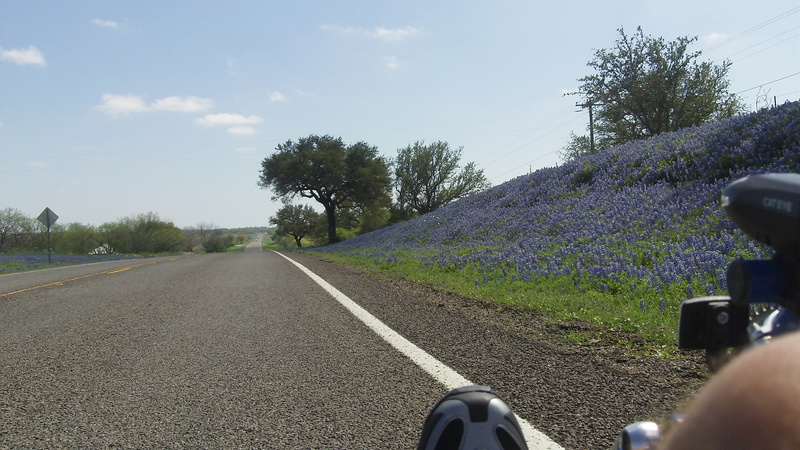 Then south on TX16 to Llano CR215 then east to FM2241 and back to the start. 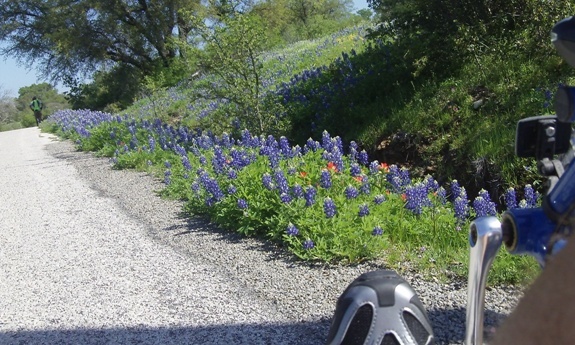 61 miles of cycling heaven! 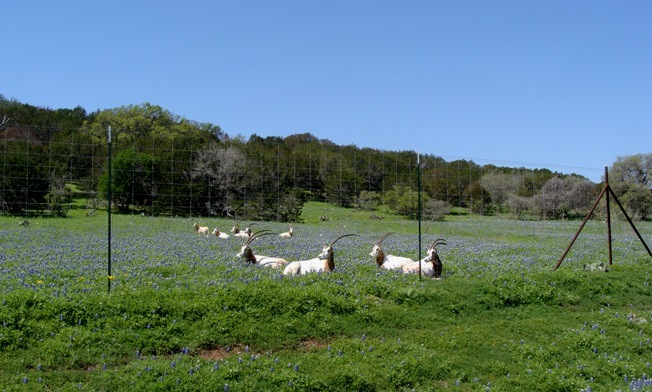 While there are some pretty flowers on TX261 and FM2241 before you get to CR216, we knew the best was NOT on those roads. 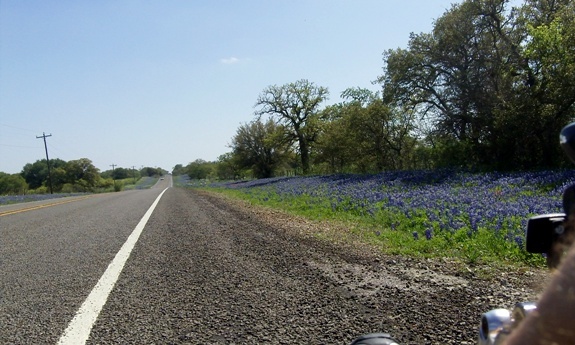 After CR216 we went north on TX16 to CR226. In the shot below we are about to turn off TX16 onto CR226. I promise that was NOT a Unicorn! Late breaking news! 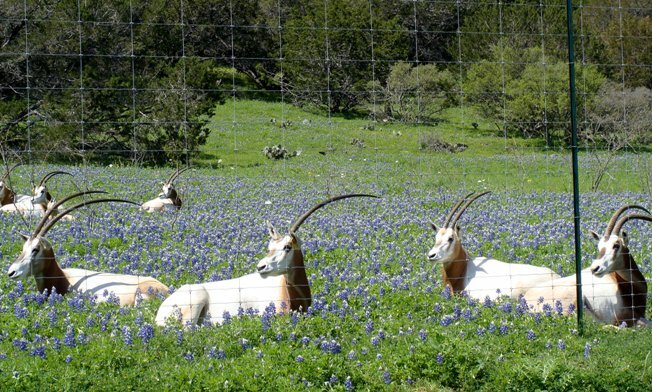 Don Senzig has advised me that the horned critters are scimitar oryx, not sable antelope. 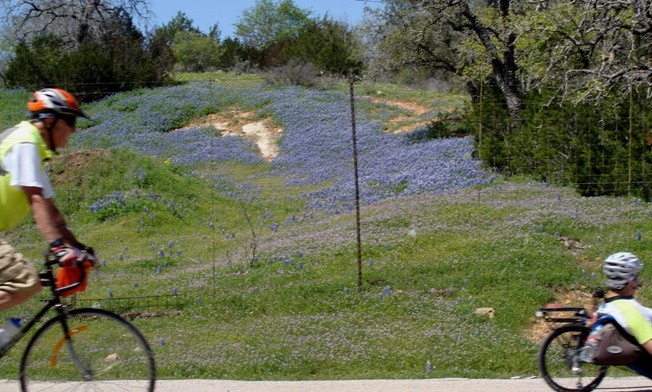 After returning to TX16 and riding about 6 miles north (mostly uphill) to Cherokee we enjoyed a burger and some of Miss Sue’s (the proprietress) sweet tea, then headed back south. After going through Baby Head Pass the flowers started getting really thick again. 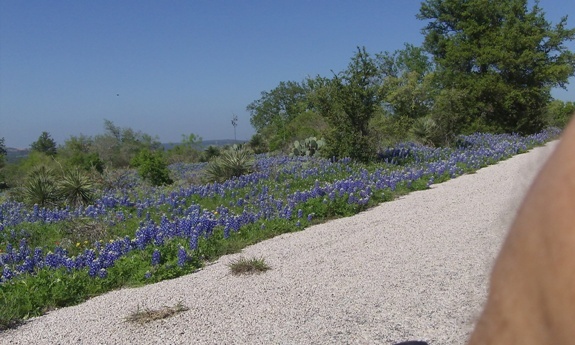 TX16 Southbound. I am sorry about the hairy leg that keeps showing up, but riding the Catrike and shooting with the on-board camera makes it tough to avoid a little manly leg showing up from time to time. 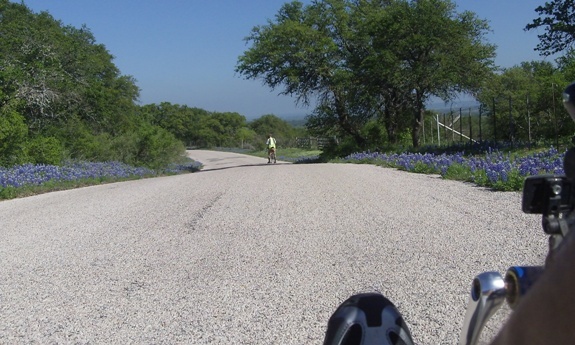 I also show a few seconds of video as we cruised down TX16 (lots of welcome downhills). Click here to view it. 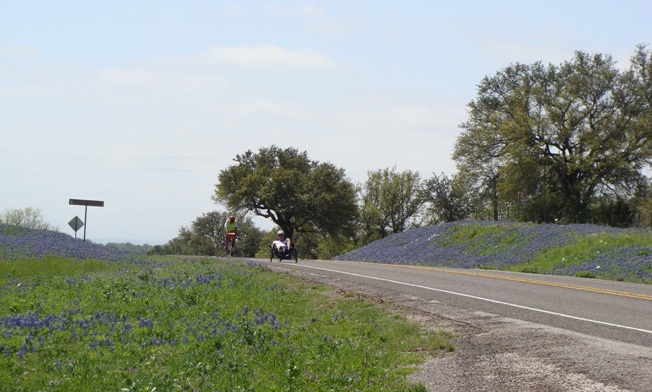 Eventually we reached the turnoff to Llano CR215, which climbs over two ridges then descends to intersect FM2241. 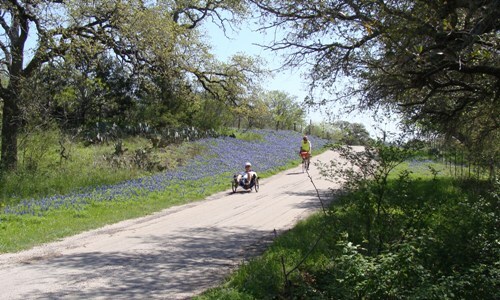 I feel sorry for people who cannot ride a bike (or Catrike) far enough to enjoy a ride like this. I feel even sorrier for people too lazy to even get out in their car, roll down the windows and drive this route. It is truly spectacular this year. 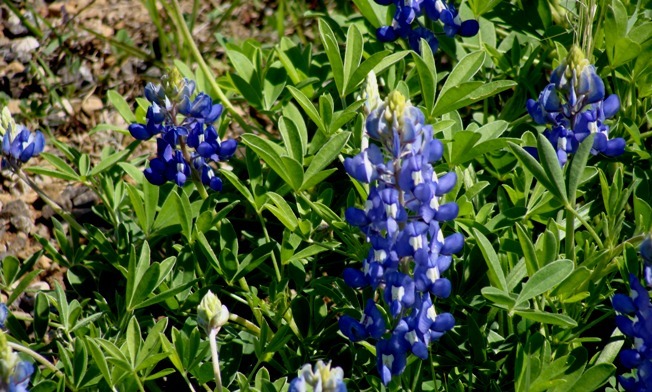 The Bluebonnets, Paint Brushes, Phlox, Wine Cups, and 6 or 7 varieties of yellow flowers are really making a show in 2012. 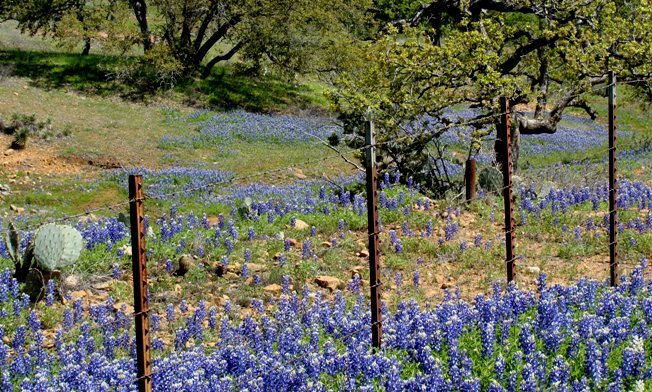 Really great wildflowers and floodwaters pictures taken on March 19 by Jim Baines. 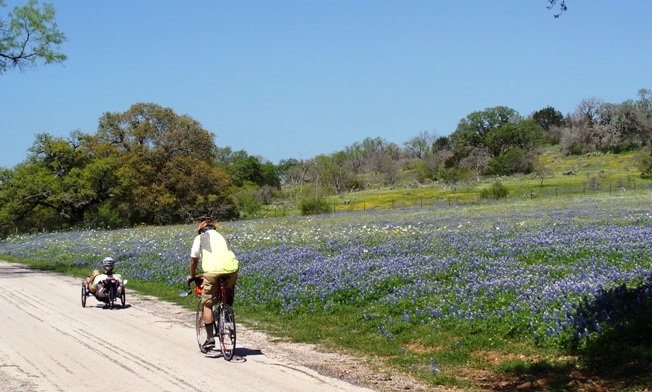 This entry was posted in Cycling - Ride Logs, Cycling - Route Descriptions, Cycling, Sailing and Surviving in The Texas Hill Country, Uncategorized and tagged Bluebonnets, Burnet TX, Catrike, Cherokee Texas, Cycling, Cycling in Llano County, Cycling in Texas, Indian Paintbrushes, Lake Buchanan, LLano, Llano County Texas, Llano River, Texas Hill Country, Wild Flowers. Bookmark the permalink.